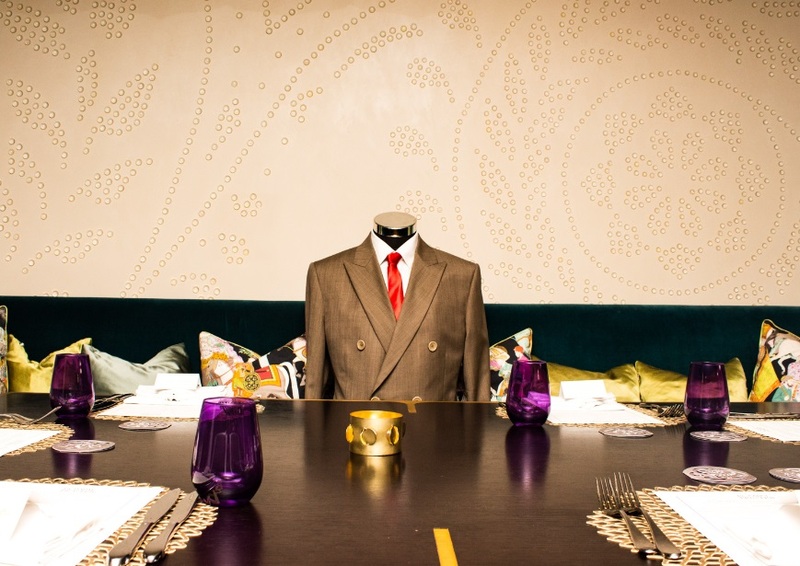 Gala Dinners and Award Ceremonies around the world usually adopt a “Black Tie” dress code. Unlike its literal meaning, Black Tie in this context means to wear a Dinner Jacket, which is more commonly known today as a Tuxedo Suit and is considered the most formal attire for a gentleman. A Dinner Jacket or Tuxedo Suits have a few elementary characteristics which one should always abide by. Traditionally a Tuxedo Suit is always made of a plain solid black fabric with a Shawl Lapel made in black shiny satin fabric, one satin fabric covered button in the front and no more than three fabric buttons on the sleeve. The trousers are without belt loops and with a one centimetre satin strip running along the outer side seam. This is worn traditionally with a black satin cummerbund and a white pleated tuxedo shirt made with a wing tip collar to wear a black bow-tie and French cuffs for black cufflinks. The entire ensemble is then topped off with black studs on the shirt and black shiny patent leather shoes which are oxfords, brogues or whole cuts. Over time a few details with regards to traditional tuxedo suits have evolved since everyone following the traditional rules of wearing a tuxedo suit started making everyone looking exactly the same in black tie events with absolutely no way to showcase their individuality. Due to this the shirt is now more commonly worn without pleats and with just black buttons instead of studs. Sometimes even the collar is made to accommodate a regular tie instead of a bow tie and the cummerbund is replaced with a black scooped waistcoat. All this has been gradually done as a conscious decision to look slightly different in a crowd of people in which everyone is wearing a tuxedo suit and has now become an acceptable variation of the traditional tuxedo suit which was originally invented by Henry Poole – The first bespoke tailor on Savile Row, London. However, making yourself stand apart whilst keeping the basic traditional rules of tuxedo suits intact is the true test of having a mature sartorial understanding. You can opt for a dark midnight blue fabric instead of the regular black one in your tuxedo suit. You could also add some hints and details by instructing your bespoke tailor to make the pocket jetting on the dinner jacket to be the same black satin fabric as your lapel and make the top border of your breast pocket in that same fabric as well. The lapel can be a peak lapel instead of the regular shawl lapel. If you feel you are going to win an award and would like to make the ultimate sartorial statement then you can opt for a dark midnight blue double-breasted tuxedo suit with a black peak or shawl lapel and black fabric buttons on the jacket paired with a black trouser. Wearing a double-breasted tuxedo suit will immediately make a powerful statement and setting yourself apart making others realize that you are a gentleman of high sartorial understanding. The final element that will put you at the top of the sartorially refined will be to wear a self-tied black bow-tie which will tell other that you are in the know of the art of tying a bow-tie which can further be made to notice by leaving it open and hanging around your neck towards the end of the event making you achieve the epitome of sartorial elegance with your tuxedo suit. Tuxedo Suits which were originally created by Henry Poole and Co. – The first Bespoke Tailor and father of Savile Row- appears to be more popular today than the topcoat although both have been around for almost the same amount of time. The Topcoat – that practical piece of outerwear- is the closest connection the modern man has to the supreme elegance of Edwardian and Victorian Tailcoats. Why is the topcoat then not as common a sight as tuxedo suits in today’s time? This apparently was not always the case. During most of the 19th century in England, the morning coat was standard attire for a gentleman outside of formal occasions and hence more commonly used than Tuxedo Suits. It was single-breasted, finished just above the knee and was made of a wool that, although heavy by modern standards, was not considered the ultimate protection from the elements. Unlike tuxedo suits, the modern topcoat certainly has echoes in both morning and frock coats. It is interesting to notice how close the topcoat is even to the original late 17th-century suit. 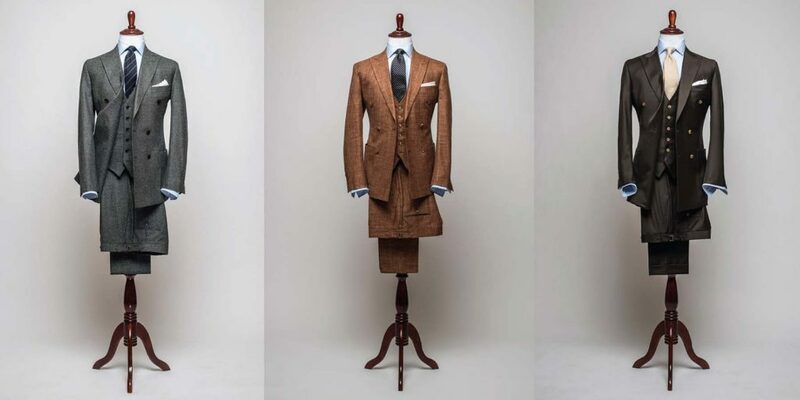 This ultimate ancestor of the male bespoke suit became popular during the late 17th century when Charles II returned to England. It comprised a long waistcoat, knew breeches and mid-length coat in the same material. Of course, there are many ways in which these bespoke coats differ from a modern topcoat and definitely bear no resemblance to the tuxedo suits. Some tailcoats, such as the dress coat, are actually cut square across the waist and don’t fasten in the middle; the morning coat is tapered similarly but sharply at the waist (reflecting its origin as a riding attire). But the most stylish topcoats are also, one could argue, one-or two-button affairs with a similar swish to the skirt, unlike the tuxedo which is strictly one-button. However, the sharp cut of a topcoat, just like tuxedo suits, certainly connotes glamour. It is the mark of the Man About Town. It swaggers and commands attention. It is old Hollywood with the likes of Fred Astaire in Top Hat or Gary Cooper in just about anything. Fred Astaire, especially wore many things in Top Hat (including a rather fetching and flowing cape) but he is best known for the morning coat that flew behind him as he danced and sang ‘Top Hat, White Tie, and Tails’, surrounded by a similarly clothed backing troupe. Gary Cooper, meanwhile, had a predilection for peak lapel coats with a fly front. Never was he seen with a tuxedo or a dinner suit or anything with even a slight resemblance to a shawl lapel. He is pictured in such a model several times over the years, most famously with Mexican actress Lupe Velez in 1929. And while such a coat has the ability to fasten three or even four buttons for warmth, it is most flattering buttoned to a single, central button and allowed to flow from the waist. 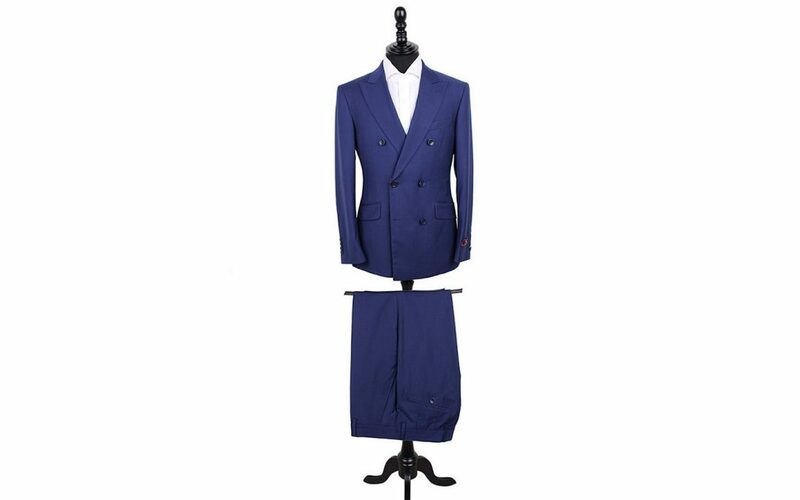 The single waist button gives any garment – jacket, topcoat or tuxedo jacket – a fulcrum on which to fix the lapels and begin the long sweep of the foreparts. The fact that most topcoats and dinner jackets are cut with one waist button and either a peak or a shawl lapel, put them on the formal end of the menswear spectrum – a view that goes back to those original tailcoats. For when the morning coat was originally introduced, in the middle of the 19th century, it was commonly found with both peaked and notched lapels. 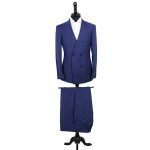 This was a time when it was considered relatively informal, or half dress, with the frock coat being the most formal option. Gradually, the morning coat replaced the frock coat and was worn almost exclusively with peaked lapels. The same has happened in reverse with tuxedo suits in the 20th century. 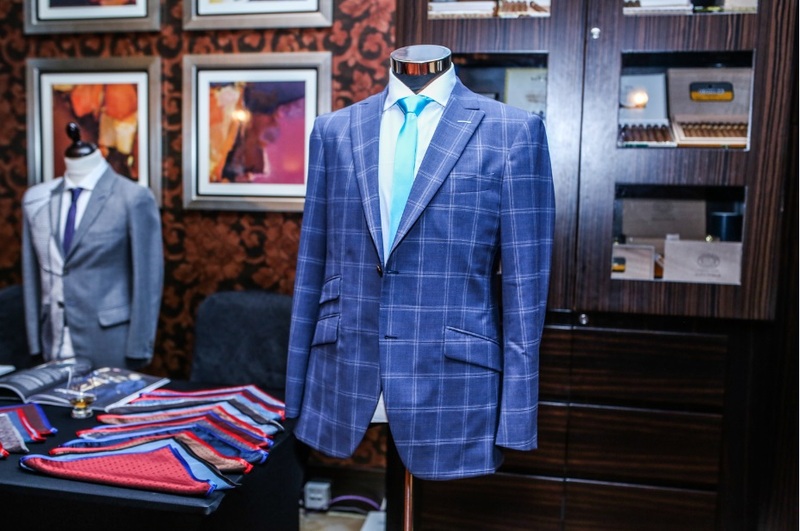 More and more are now made with the shawl lapel as men consider them less and less formal (or we have to presume they do, given how willing they are to wear cheap rental tuxedos). One more reason, perhaps, to hold on to the swagger of the topcoat over and above tuxedo suits. The term ‘topcoat’ has not been used consistently over the years, unlike tuxedo suits which have always had a constant definition. In fact, it dropped out of use entirely at one point and has often been conflated with the overcoat in the nomenclature. We can define it in contrast to the overcoat, as the outer layer that is both shorter and lighter in weight. It finishes on or just above the knew and adds warmth and protection from the elements, but without the bulk of an overcoat. Partly for that reason, it is usually single breasted. Defining it thus, by virtue of its weight, length, and use helps to understand why the topcoat is so inherently stylish compared to tuxedo suits. It is appealing because it is so versatile. It can be sporty as a blazer over knitwear and jeans or elegant with a suit and tie. Today, the style and range of can be quite vast but the recognizable elements of the close waist and flowing tails are always there. Such is the appeal of the 19th-century tailcoats angular lines and flattering proportions that it has survived, in form if not in name, as every gentleman’s go-to coat. The workroom where the Master Shoemaker brings Handmade shoes into existence has air that is thick with the rich smell of the finest hides money can buy which hang around the room in a splendid display of chromatic exuberance. At the far end of the room, standing at one end of a rustic wooden workbench is a Handmade shoemaker who is everything one wants a Gaelic artisan to be in appearance is eyeing up a calf hide in rich maroon spread out before him. Actually, the handmade shoemaker is poring over it, his intense resolve crevicing his forehead, the way an aerial sea patroller might survey a coastline for sharks. The handmade shoemaker, having decided he has spotted every flaw and assessed how to work around the defects to maximum effect; he takes his blade and begins creating what will become the uppers of a discerning customer’s next pair of handmade shoes. The skilled artisan of handmade shoes is key partly because the way you cut the leather determines how much you waste but much more importantly his work also decides the quality of components you have to work with later. The handmade shoemaker needs to be able to spot the defects and cut around them. Any slight defect such as insect bites, wrinkles, scratches where the animal has rubbed against barbed wire will soon become obvious when the patina is applied to the leather. The hawk-eyed handmade shoemaker is also required to pick out veins that are a fraction-of-a-millimeter thick because using any of these will make the leather weaker making it split when the bottom is attached. The handmade shoes need to be made by cutting the leather around them. The hide which is subjected to such critical scrutiny will make no more than two pairs of shoes. In the case of crocodile skin, two skins are required to make one pair of handmade shoes partly because you need to use the softer, supplier part of the hide with larger scales in the center. It is well known that in handmade shoes if you see smaller scales it means the company has used lower quality side parts of the crocodile and also because the scales need to match given that crocodile skins are like human fingerprints in terms of individuality. This is an extremely tricky matter of value judgment. It means that only one-third of the animal skin purchased will end up as a pair of handmade shoes. It is definitely a costly decision, but it is where the reputation of the company rests on. Handmade shoes tend to come in clean, narrow versions of classic shapes and are often spruced up by subtle sole engravings, bright piping, or rich patinas in sapphire, olive or dark blue. A common sight in the workroom is a handmade shoemaker armed with special pliers manipulating a lining and leather upper around a last, assessing the tension and pressure with frowning, obsessional vigor, occasionally blasting the leather with a blow heater to make it more malleable before reworking it further. Watching the handmade shoemaker, it feels like eternity before he finally decides to apply the upper evenly using tacks, which serve a similar purpose to baste stitching in bespoke tailoring. If he stretches the leather even a fraction too much before tacking, the upper’s being off center will be noticeable to the discerning customer. 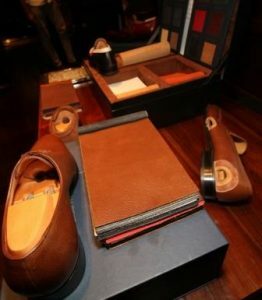 At the patina stage, where the handmade shoes are given the beautiful chromatic finishes that will enable connoisseurs that will recognize the shoes as being distinctly handmade as the colors are brushed on with the loving, ultra-alert sedulousness of an artist applying oil to a canvas. Every artisan of handmade shoes including the one who applies the final touch of detail carries out his role as if the overall quality of the pair of handmade shoes depended on his professional excellence. A place where these children of the Eye known as hand-made shoes breeds passion of excellence with the community encouraging artisanal culture, making one feel pride and a quiet sense of confidence when wearing a pair of handmade shoes.